Human Interest Reviews - Right Solution For Your 401k? Human Interest offers 401(k) and 403(b) programs for small- to medium-sized businesses who want a simple solution for a company-wide retirement plan. 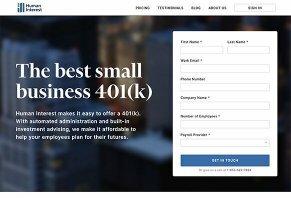 Human Interest is a financial service based in San Francisco and offering automated, affordable 401(k) and 403(b)retirement programs for small- to medium-sized businesses. Human Interest chose to use index funds for the retirement plans because they offer a low-fee way to invest and because mutual funds, they say, are run by financial institutions whose goal is to make money through high fees and kickbacks. Human Interest launched in 2015. Its team is made up of a variety of young professionals with impressive educational backgrounds including degrees from Harvard, Princeton, Stanford and the Massachusetts Institute of Technology. The company’s CEO is Roger Lee, a Harvard grad who passed the Series 65, one of several federally regulated tests required to be a financial adviser. We’re going to take the next few minutes to help you understand what a 401(k) is and why it differs from Individual Retirement Accounts (IRAs), how Human Interest’s retirement accounts work, what fees your organization can expect to pay Human Interest and what others are saying about Captian401. What’s a 401(k) and How Does It Differ From an IRA? Understanding what a 401(k) is and why it’s different from an IRA is a matter of looking at some of the basics of a retirement account: who can get one, how taxes work and what the limits are. Who Can Get a 401(k) versus an IRA? A 401(k) is the name for a retirement plan offered through a for-profit employer, while an IRA is available to anyone, regardless of their employment status. So, for example, a self-employed freelancer can contribute to an IRA account, but cannot get a 401(k) because they aren’t a salaried/part-time employee of any company. It’s important to remember that 401(k) represents three different kinds of retirement plans: traditional 401(k), Safe Harbor 401(k) and SIMPLE 401(k). For our purposes here, we’re going to focus on the most popular 401(k) format: traditional. How Do Taxes Work for a 401(k)? With a traditional 401(k), contributions to the retirement account are automatically taken pre-tax from an employees’ paycheck. You tell HR what percentage of your paycheck you want to deposit to your 401(k) and they set it in motion. In some cases, employers will do what’s known as “matching”, which means they match your contributions up to a certain percentage. For instance, some companies offer a 3% match, which means if you elect to contribute 3% of your paycheck to your 401(k), your employer will contribute 3% of your paycheck. So, if your 3% is $60, they’ll throw in $60, too. Companies are allowed to deduct 401(k) contributions they make, which is what’s known as a tax break. Once it’s time to withdraw your 401(k) (59 ½ years if you don’t want a penalty), you’ll be taxed on your withdrawal. While 401(k) and IRA’s seem like a great way to save up for retirement (they are), they do have one big downside that you wouldn’t face if you invested in non-retirement accounts like mutual funds, index funds or ETFs through a financial adviser or robo-advisor: contribution caps. According to government regulations, annual contributions into a 401(k) are capped at $18,000 for those under 50 ($5,500 for IRAs) and $24,000 for those over 50 ($6,500 for IRAs). Pro tip: If you want to learn more about how a 401(k) would look for your business, Human Interest’s blog has great posts about nuances for retirement plans. Earlier we mentioned that Human Interest offers 403(b) retirement plans, which are basically a 401(k) for nonprofit companies, public schools and a few other organizations. The contribution limits are the same, but 403(b) plans typically come with more fees because they aren’t as heavily regulated as 401(k) plans. How Does the Human Interest Retirement Plan Work? The Human Interest process is relatively simple, they claim. You contact them through an online form or by phone (1-855-6-CAPTAIN). Once you get the ball rolling with an account executive, you’ll find that Human Interest acts like a specialized HR office that only runs your 401k. Practically speaking, that means Human Interest will link to your payroll company and make automatic deductions just like your human resources department did in years past. In terms of how they choose their investments, Human Interest focuses on placing your employee’s money in index funds. The index funds they mentioned have good reputations, and do not, Human Interest says, tangle you up with self-interested advisors who run mutual funds. Included in Human Interest’s investment services is free personalized investment advice for employees who want “more flexibility” for choosing and managing their own funds. It’s also worth noting that Human Interest is plan fiduciary, which means they have a legal responsibility under the Employee Retirement Income Security Act of 1974 (ERISA) to make investment decision solely based on the best interest of the contributing employees. What Are the Fees for Using Human Interest? Human Interest’s fee structure is straightforward for clients with less than $5 million in assets. Employers pay a flat fee of $120 a month and $4 per month for each employee. Also, a $499 fee may be charged to setup their services, but their site does not indicate in which situations that fee would be charged. Employees will pay a 0.5% monthly fee, which, according to Human Interest’s site, covers advisory, custodial and advisory fees. It’s hard to tell how much Human Interest’s fees are in terms of percentages; it stands to reason that a company with employees who invest more get more value out of the partnership with Human Interest. In general, however, we wouldn’t be surprised if their fees may not be as much of a bargain as they would have been a few years ago. The Wall Street Journal reported in May 2016 that 401(k) fees were low and were falling lower still. If your company has more than $5 million to invest, the Human Interest site says you may be subject to different fees. What Are Other People Saying About Human Interest? One way to get a good read on fees and services is to hear what your fellow companies and employees are saying about a retirement service like Human Interest. While user reviews were hard to find, there were several articles from well-known websites who discussed the merits of a low-cost 401(k) provider. In a 2015 article, employee-benefits site Employee Fiduciary did a quick rundown of Human Interest and its investment competitors ForUsAll and Honest Dollar. Author Eric Droblyen expressed some skepticism about the site’s low fees ($90 per month at that time), as well as problems that could arise from the supposed 10 minutes it takes businesses to sign up for Human Interest’s services. He argued that an efficient, customized plan takes longer than 10 minutes to put together. Investor Junkie reviewer Ruth Lyons gave Human Interest 4 stars, saying that, though the service isn’t perfect, it provides a feasible retirement plan for the more than 70 million workers who work for companies that don’t have 401(k) plans set up. There’s one fact that really stood out to use when we did our research for this review – more than 70 million employees don’t have access to a 401(k) through their employer. Thankfully, 401(k) companies like Human Interest have come along to bridge that gap by offering a simple solution for small- and medium-sized businesses who don’t have the time or energy to navigate a lengthy, paperwork-mired onboarding process. If you’re looking for a company to help you launch a clear, uncomplicated 401(k) program, Human Interest has a solid solution. However, as we do in every review of a financial product, we encourage you to use your initial consultation with Human Interest to gather data about the real cost of the service. Do the math and figure out how much fees you and your employees will pay. Then, take those totals and compare them to your budget. Do you have enough money to pay Human Interest’s service fees? As you ponder that question, gather fee quotes from at least two other 401(k) companies similar to Human Interest – America’s Best 401(k), Employee Fiduciary and Ubiquity are three examples of companies who offer a similar service. Once you know the hard numbers for each service as well as what products they offer, you can make a wise decision. Whichever company you choose – Human Interest or otherwise – it’s a great era for small- and medium-sized businesses, the New York Times reporter Tara Siegel Bernard wrote in a Sept. 2015 article. Write a Review for Human Interest!